Excited for the iPhone 5 reveal? As we’ve been reporting for the past few weeks, September 12 is expected to be the day when Apple finally showcases the long-awaited sixth version of their revolutionary smartphone — the iPhone 5. 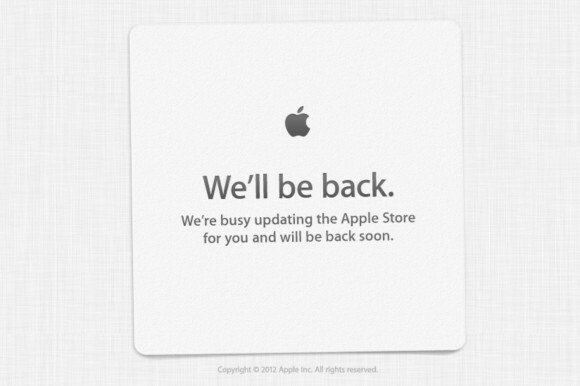 And today (to no one’s surprise, really) it looks like the Apple store is preparing for the big event. The iPhone 5 is rumored to come with several highly-demanded improvements to its predecessor. According to earlier reports, it should have a bigger 4-inch screen, an updated two-tone casing and will possibly include LTE-connectivity. The iPhone 5 is also rumored to have a connector smaller than the current 30-pin variant (and should upset some iOS device owners who may end up with third-party accessories gathering dust until an adapter comes out) and a headphone connector placed at the bottom of the unit, similar to the the location that devices like Samsung and Google’s Nexus phones have adopted. There’s still debate whether this version of the iPhone will finally follow suit and include an NFC chip and, should it be present, if its features will be immediately available. In addition to the iPhone 5, there are also rumors that today’s event could include several other new product launches for other Apple mainstays such as the next generation iPods. The early buzz indicates that we might see a slightly larger iPod Touch, one that is expected to mimic the aesthetics of the iPhone 5, and new designs for the smaller members of the iPod family, the iPod Nano and the iPod Shuffle. Stay tuned for more updates on the iPhone 5’s launch here on Tapscape!